Salisbury Cathedral, formally known as the Cathedral Church of the Blessed Virgin Mary, is an Anglican cathedral in Salisbury, England. The cathedral is regarded as one of the leading examples of Early English architecture: its main body was completed in 38 years, from 1220 to 1258. Since 1549, the cathedral has had the tallest church spire in the United Kingdom, at 404 feet (123 m). Visitors can take the "Tower Tour", in which the interior of the hollow spire, with its ancient wooden scaffolding, can be viewed. The cathedral has the largest cloister and the largest cathedral close in Britain at 80 acres (32 ha). It contains a clock which is among the oldest working examples in the world, and has the best surviving of the four original copies of Magna Carta. In 2008, the cathedral celebrated the 750th anniversary of its consecration. The cathedral is the mother church of the Diocese of Salisbury and is the seat of the Bishop of Salisbury, currently Nick Holtam. As a response to deteriorating relations between the clergy and the military at Old Sarum Cathedral, the decision was taken to re-site the cathedral, with the seat of the bishopric being moved to New Sarum, or Salisbury. The move occurred during the tenure of Richard Poore, a rich man who gave the land on which the new cathedral was built. Construction was paid for by donations, principally from the canons and vicars of southeast England, who were asked to contribute a fixed annual sum until the building was completed. A legend tells that the Bishop of Old Sarum shot an arrow in the direction he would build the cathedral; the arrow hit a deer, which died in the place where Salisbury Cathedral is now. The cathedral crossing, Old Sarum, and Stonehenge are reputed to be aligned on a ley line, although Clive L. N. Ruggles asserts that the site, on marshland, was chosen because a preferred site several miles to the west could not be obtained. The foundation stone was laid on 28 April 1220. Much of the freestone for the cathedral came from the Teffont Evias Quarry. As a result of the high water table on the new site, the cathedral was built on foundations only 4 feet (1.2 m) deep, and by 1258 the nave, transepts, and choir were complete. The only major sections begun later were the cloisters, added in 1240, the chapter house in 1263, the tower and spire, which at 404 feet (123 m) dominated the Wiltshire skyline from 1320. Because most of the cathedral was built in only 38 years, it has a single consistent architectural style, Early English Gothic. Although the spire is the cathedral's most impressive feature, it has proved troublesome. Together with the tower, it added 6,397 tons (6,500 tonnes) to the weight of the building. Without the addition of buttresses, bracing arches and anchor irons over the succeeding centuries, it would have suffered the fate of spires on other great ecclesiastical buildings (such as Malmesbury Abbey, 1180 to 1500; Lincoln Cathedral, 1311 to 1549; and Chichester Cathedral, 1402 to 1861) and fallen down; instead, Salisbury became the tallest church spire in the country on the collapse at Lincoln in 1549. The large supporting pillars at the corners of the spire are seen to bend inwards under the stress. The addition of reinforcing tie-beams above the crossing, designed by Christopher Wren in 1668, halted further deformation. The beams were hidden by a false ceiling installed below the lantern stage of the tower. Significant changes to the cathedral were made by the architect James Wyatt in 1790, including the replacement of the original rood screen and demolition of a bell tower which stood about 320 feet (98 m) northwest of the main building. Salisbury is one of only three English cathedrals to lack a ring of bells, the others being Norwich Cathedral and Ely Cathedral. However, its medieval clock does strike the time with bells every 15 minutes. In total, 70,000 tons of stone, 3,000 tons of timber and 450 tons of lead were used in the construction of the cathedral. On 25 October 2018, there was an attempted theft of the Magna Carta from the cathedral; the alarms were triggered and a 45-year-old man was later detained on suspicion of attempted theft, criminal damage and possession of an offensive weapon. The outer layer of a double-layered glass case containing the document was broken, but the Magna Carta itself suffered no damage. The west front is of the screen-type, clearly deriving from that at Wells. It is composed of a stair turret at each extremity, with two niched buttresses nearer the centre line supporting the large central triple window. The stair turrets are topped with spirelets, and the central section is topped by a gable which contains four lancet windows topped by two round quatrefoil windows surmounted by a mandorla containing Christ in Majesty. At ground level there is a principal door flanked by two smaller doors. The whole is highly decorated with quatrefoil motifs, columns, trefoil motifs and bands of diapering. The west front was almost certainly constructed at the same time as the cathedral. This is apparent from the way in which the windows coincide with the interior spaces. The entire facade is about 108 feet (33 m) high and wide. It has been said that the front was built on a scale smaller than was initially planned. [by whom?] 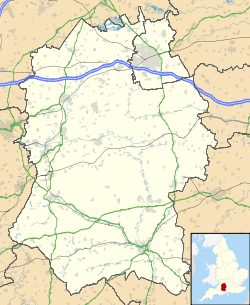 It lacks full-scale towers and/or spires as can be seen, for example at Wells, Lincoln, Lichfield, etc. The facade was disparaged by Alec Clifton-Taylor, who considered it the least successful of the English screen facades and a travesty of its prototype (Wells). He found the composition to be uncoordinated, and the Victorian statuary "poor and insipid". The front accommodates over 130 shallow niches of varying sizes, 73 of which contain a statue. The line of niches extends round the turrets to the north, south and east faces. There are five levels of niches (not including the mandorla) which show, from the top, angels and archangels, Old Testament patriarchs, apostles and evangelists, martyrs, doctors and philosophers and, on the lower level, royalty, priests and worthy people connected with the cathedral. The majority of the statues were placed during the middle of the 19th century, however seven are from the 14th century and several have been installed within the last decade. 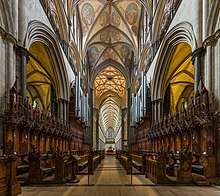 Salisbury Cathedral is unusual for its tall and narrow nave, and has visual accentuation due to the use of light grey Chilmark stone for the walls and dark polished Purbeck marble for the columns. It has three levels: a tall pointed arcade, an open gallery and a small clerestory. Lined up between the pillars are notable tombs such as that of William Longespée, half brother of King John and the illegitimate son of Henry II, who was the first person to be buried in the cathedral. The chapter house is notable for its octagonal shape, slender central pillar and decorative medieval frieze. It was redecorated in 1855-9 by William Burges. The frieze circles the interior above the stalls and depicts scenes and stories from the books of Genesis and Exodus, including Adam and Eve, Noah, the Tower of Babel, and Abraham, Isaac and Jacob. The chapter house also displays the best-preserved of the four surviving original copies of Magna Carta. This copy came to Salisbury because Elias of Dereham, who was present at Runnymede in 1215, was given the task of distributing some of the original copies. 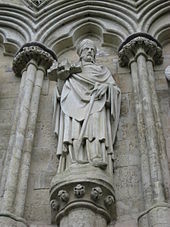 Elias later became a canon of Salisbury and supervised the construction of the cathedral. The Salisbury cathedral clock, which dates from about AD 1386, is supposedly the oldest working modern clock in the world. The clock has no face; all clocks of that date rang out the hours on a bell. It was originally located in a bell tower that was demolished in 1792. Following this demolition, the clock was moved to the Cathedral Tower, where it was in operation until 1884. The clock was then placed in storage and forgotten until it was discovered in an attic of the cathedral in 1928. It was repaired and restored to working order in 1956. In 2007, remedial work and repairs were carried out. 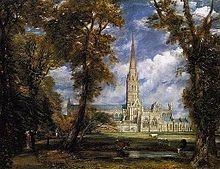 Salisbury Cathedral by John Constable, ca. 1825. The cathedral is the subject of famous paintings by John Constable. As a gesture of appreciation for John Fisher, Bishop of Salisbury, who commissioned this painting, Constable included the bishop and his wife in the canvas (bottom left). The view depicted in the paintings has changed very little in almost two centuries. William Herbert, 3rd Earl of Pembroke (1580–1630), politician and courtier, buried in a family vault in front of the altar. The cathedral's current organ was built in 1877 by Henry Willis & Sons. Walter Alcock, who was organist of the cathedral from 1916, oversaw a strictly faithful restoration of the famous Father Willis organ, completed in 1934, even going to such lengths as to refuse to allow parts of the instrument to leave the cathedral in case any unauthorised tonal alterations were made without his knowledge, while allowing some discreet additions in the original style of the organ (as well as modernisation of the organ's actions) by Henry Willis III, the grandson of Father Willis. An earlier organ by Samuel Green was presented by George III in 1792 and was installed on top of the stone screen, which, unusually, did not divide the choir from the nave, but rather came from an unknown location in the cathedral. The organ was later taken out and moved to St Thomas's Church. It is recorded that in 1463 John Kegewyn was organist of Salisbury Cathedral. Among the notable organists of more recent times have been a number of composers and well-known performers including Bertram Luard-Selby, Charles Frederick South, Walter Alcock, David Valentine Willcocks, Douglas Albert Guest, Christopher Dearnley, Richard Godfrey Seal and the BBC presenter Simon Lole. 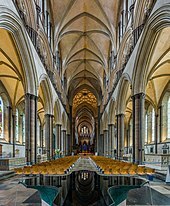 Salisbury Cathedral Choir holds annual auditions for boys and girls aged 7–9 years old for scholarships to Salisbury Cathedral School, which housed in the former Bishop's Palace. The boys' choir and the girls' choir (each 16 strong) sing alternate daily Evensong and Sunday Matins and Eucharist services throughout the school year. There are also many additional services during the Christian year particularly during Advent, Christmas, Holy Week, and Easter. The Advent From Darkness to Light services are the best known. Choristers come from across the country and some board. Six lay vicars (adult men) comprise the rest of the choir, singing tenor, alto and bass parts. In 1993, the cathedral was the venue for the first broadcast of Choral Evensong (the long-running BBC Radio 3 programme) to be sung by a girls' cathedral choir. The cathedral previously employed five cathedral constables (known as "Close Constables"), whose duties mainly concerned the maintenance of law and order in the cathedral close. They were made redundant in 2010 as part of cost-cutting measures and replaced with "traffic managers". The constables were first appointed when the cathedral became a liberty in 1611 and survived until the introduction of municipal police forces in 1835 with the Municipal Corporations Act. In 1800 they were given the power, along with the city constables, to execute any justices' or court orders requiring the conveyance of prisoners to or from the county jail (at Fisherton Anger, then outside the city of Salisbury) as if it were the city jail (and, in so doing, they were made immune from any legal action for acting outside their respective jurisdictions). The right of the cathedral, as a liberty, to maintain a separate police force was conclusively terminated by the Local Government Act 1888. In February 2016, the cathedral chapter placed Sophie Ryder's sculpture The Kiss straddling a path on the grounds where it was to remain until July. After only a few days, the work had to be moved, as pedestrians kept bumping into it while texting. Between 1864 and 1953, there were records of peregrine falcons being present at the Cathedral. More arrived in 2013, and have been hatching every year since, with their nests on the cathedral's tower. The interior of the spire, showing the original supporting framework. ^ a b c "Visitor Information, Salisbury Cathedral". Retrieved 17 January 2008. ^ "Adding the Spire". Salisbury Cathedral Website. 13 September 2018. Retrieved 13 September 2018. 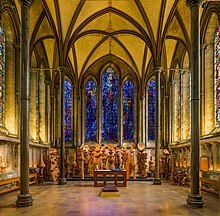 ^ "Salisbury Cathedral's 750th Anniversary Open Day An Overwhelming Success". Salisbury Cathedral. 28 April 2008. Archived from the original on 8 December 2015. Retrieved 19 October 2015. ^ Ruggles, Ancient Astronomy: An Encyclopedia of Cosmologies and Myth, 2005:225 "A notorious example...a ley line joining Stonehenge (third millennium B.C.E. ), Old Sarum (first millennium B.C.E. ), and Salisbury cathedral (C.E. 1220)." ^ "The Cathedrals of Britain". BBC History. Retrieved 14 July 2014. ^ "Man arrested for Magna Carta theft attempt at Salisbury Cathedral". BBC News. 26 October 2018. Retrieved 26 October 2018. ^ "Salisbury Cathedral". Sacred Destinations. Retrieved 14 July 2014. ^ "Salisbury Cathedral". Britain Express. Retrieved 14 July 2014. ^ "Oldest Working Clock, Frequently Asked Questions, Salisbury Cathedral". Retrieved 8 April 2009. ^ "Clock repaired, Salisbury Cathedral". Retrieved 17 January 2008. ^ Follett, Ken. "Is Kingsbridge Real?". www.ken-follett.com. Archived from the original on 23 June 2012. Retrieved 10 April 2011. ^ "Cathedral Chapter". Salisbury Cathedral. Retrieved 8 February 2019. ^ "Installation of Canon Nicholas Papadopulos as Dean". Salisbury Cathedral. Retrieved 24 December 2018. ^ "Salisbury Cathedral – New Chancellor". Salisburycathedral.org.uk. Retrieved 13 September 2018. ^ "New Canon Treasurer appointed". Salisbury Cathedral. Retrieved 24 December 2018. ^ "Arundells, Cathedral Close, Salisbury, Wiltshire". www.arundells.org. Retrieved 29 May 2017. ^ "Wiltshire, Salisbury Cathedral of the Blessed Virgin Mary". National Pipe Organ Register. Retrieved 10 April 2011. ^ "Wiltshire Salisbury, Cathedral of the Blessed Virgin Mary [N10306]". The National Pipe Organ Register. The British Institute of Organ Studies. Retrieved 14 March 2017. ^ Armfield, A.H. (1890). Cathedrals, abbeys, and churches of England and Wales. London: Cassell & Company. p. 130. ^ Cathedrals; 2nd ed. London: Great Western Railway, 1925; p. 33. ^ "Timeline of the History of Choral Evensong". BBC Radio 3. Retrieved 16 October 2017. ^ Hough, Andrew (6 August 2010). "Anger after Salisbury Cathedral Constables 'scrapped to save money'". The Daily Telegraph. Retrieved 24 January 2011. ^ "Salisbury Cathedral Close Constables". Cathedral Constables' Association. Retrieved 24 January 2011. ^ "Statute Law Revision: Gaols: Repeal Proposals" (PDF). Law Commission. April 2006. Archived from the original (PDF) on 2 February 2011. Retrieved 17 June 2011. ^ Burke, Dave (20 February 2016). "This 20ft statue had to be moved because people walked into it while texting". Metro. Retrieved 3 July 2018. ^ "Salisbury Cathedral giant hands artwork 'bumped into by texters'". BBC News. 19 February 2016. ^ "Peregrine Falcons | Salisbury Cathedral". www.salisburycathedral.org.uk. Retrieved 5 June 2018. Martín-Gil, J; Martín-Gil, FJ; Ramos-Sánchez, MC; Martín-Ramos, P. The Orange-Brown Patina of Salisbury Cathedral (West Porch) Surfaces: Evidence of its Man-Made Origin. Environmental Science and Pollution Research, 12(5):285–289. 2005. Wikimedia Commons has media related to Salisbury Cathedral.